What’s the most important thing a person can do to help an indie author out? Review the book on Amazon, Goodreads, and anywhere else you might leave reviews. It seems like such a small thing, but think about it: Independently published authors don’t have a publishing house with a marketing department. There’s no book tour. There’s no write-up in the New York Times. Oprah hasn’t even read it yet. But who has read it? You! You could tell your friends about this book you just read, and maybe a few of them will listen and buy it themselves. Or, if you posted a review on Amazon, you could tell your hundred-thousand closest friends about this book you just read. Maybe a few of them would listen. What’s the difference? A “few” of a hundred thousand is a lot of people. Digital word of mouth: it’s the only real way that word of a new book can spread. Give it a try yourself: Post a review here. One more step on the road to publication: COYOTE has been sent off to the editing and proofreading mavens. Now I bite my fingernails and see what horrors they come up with. 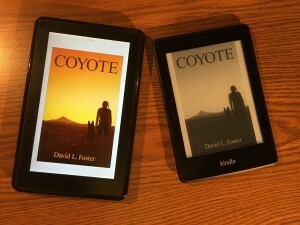 In other news, I figured out how to make an ebook file for myself and deliver COYOTE to my various Kindles. Feeling smart (for now).